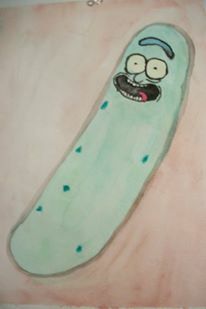 간물, 피 클 Riiiiiiiiiiiiiiiiick in watercolor. I was bored one day, saw the commercial for the 간물, 피 클 Rick episode, decided to paint 간물, 피 클 Rick. Wallpaper and background images in the Rick and Morty club tagged: photo pickle rick rick and morty rick pickle.